My relationship to puer is a strange one. Unlike other teas, I sometimes find it intimidating (too fussy, I should rather say), especially its long term storage for ageing. Also, I’m not super keen on ripe puer (even though I had some pretty incredible ripe puer when I visited David Lee Hoffman in Lagunitas) and I can confidently say I gravitate towards raw puer. Even so, can you believe I had never owned a whole puer cake until recently? I had always bought loose-leaf raw and ripe puer teas. Mind you, that doesn't mean I’m immune to its fascination. A few months ago, I won a giveaway by Bitterleaf, the Kunming-based company whose tea ware and tea photography I regularly swoon over on Instagram. The prize? A cake of 2018 Yiwu raw puer. I’m currently reading the book “Puer Tea: Ancient Caravans and Urban Chic” by Jinghong Zhang and according to the author “the iconic Puer tea of Yiwu had always been raw tea (sheng cha) intended for natural fermentation”. 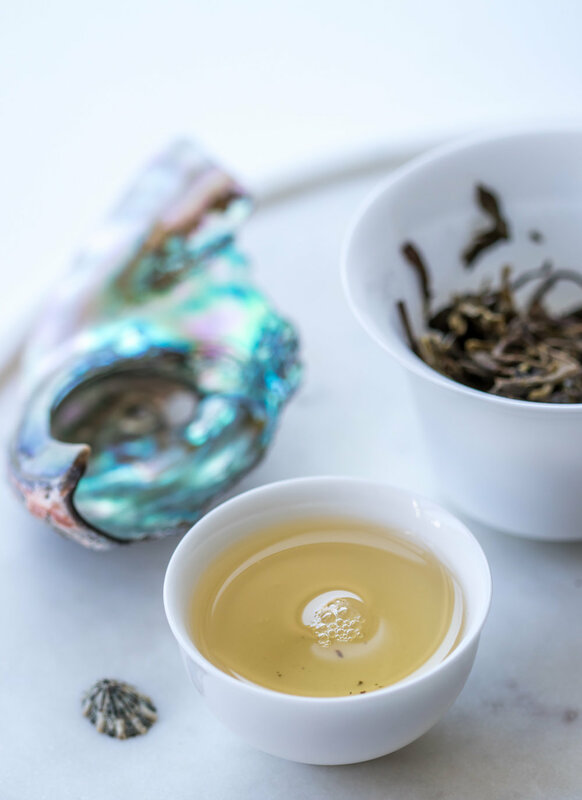 Within Yunnan, Yiwu tea and “Yiwu taste” seem to be traditionally juxtaposed to Menghai tea and “Menghai taste”, famous for its ripe puer. But that’s a different story, for a more in-depth blog post. While tasting my 2018 Yiwu raw puer, I practiced my macro photography skills (I have a new lens, yay!) and mindfulness with some gorgeous sea shells I found along the coast on a beautiful beach in Mendocino, California. The large one is the fragment of an abalone shell (a type of sea snail). I gently scrubbed it with a toothbrush and polished the inside with some olive oil to make it shine even more. Isn’t it mesmerizing? Steep Time: 5 second rinse, 5 second brew (then increase by 5 seconds each brew). These are the instructions I found on the Bitterleaf website. OVERALL IMPRESSION: I’m very very much into it! Here you can find Bitterleaf Year of the Dog 2018 Yiwu Raw Puer.